Thank you for visiting my Blog. 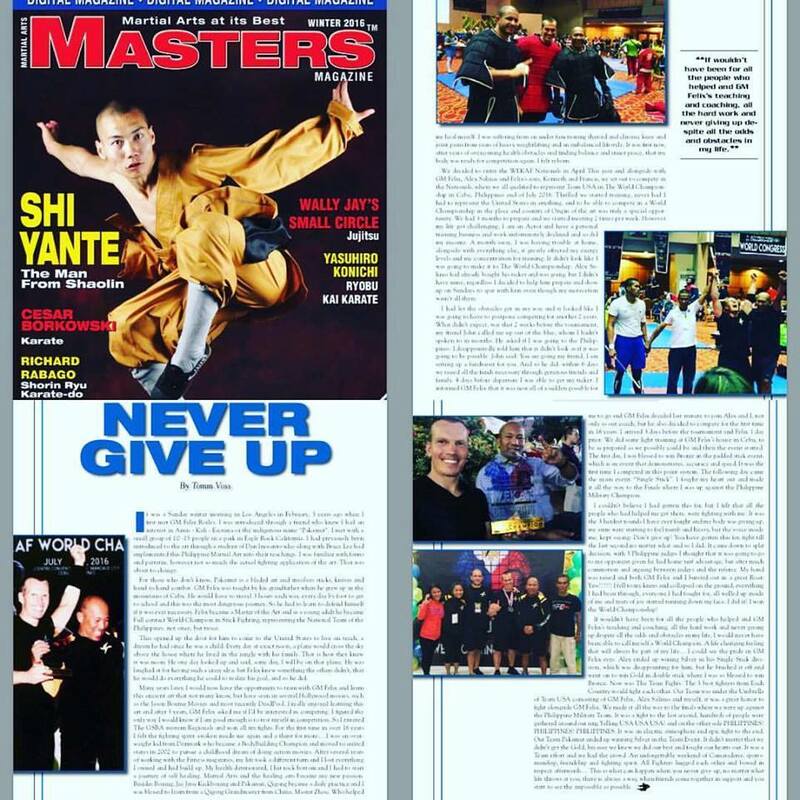 Here is my article “Never Give Up” that was featured in Masters Magazine’s winter issue. I am now sharing it with you. application of the art. That was about to change. For those who don’t know, Pakamut is a bladed art and involves sticks, knives and hand to hand combat. GM Felix was taught by his grandfather when he grew up in the mountains of Cebu. He would have to travel 3 hours each way, every day by foot to get to school and this was the most dangerous journey. So he had to learn to defend himself if it was ever necessary. Felix became a Master of the Art and as a young adult he became Full contact World Champion in Stick Fighting, representing the National Team of the Philippines. not once, but twice. This opened up the door for him to come to the United States to live an teach, a dream he had since he was a child. Every day at exact noon, a plane would cross the sky above the house where he lived in the jungle with his family. That is how they knew it was noon. laughed at for having such a crazy idea, but Felix knew something the others didn’t, that he would do everything he could to realize his goal, and so he did. Many years later, I would now have the opportunity to train with GM Felix and learn this ancient art that not many know, but have seen in several Hollywood movies, such as the Jason Bourne Movies and most recently DeadPool. I was an overweight kid from Denmark who became a BodyBuilding Champion and moved to united states in 2002 to pursue a childhood dream of doing action movies. After several years of working with the Fitness magazines, my life took adifferent turn and I lost everything I owned and had build up. My health deteriorated, I hit rock bottom and I had to start a journey of self healing. Martial Arts and the healing arts became my new passion. Besides Boxing, Jui Jitsu Kickboxing and Pakamut, Qigong became a daily practice and I was blessed to learn from a Qigong Grandmaster from China, Master Zhou. Who helped me heal myself. I was suffering from an under functioning thyroid and chronic knee and joint pains from years of heavy weightlifting and an imbalanced lifestyle. It was first now, after years of overcoming health obstacles and finding balance and inner peace, that my body was ready for competition again. I felt reborn. We decided to enter the WEKAF Nationals in April This year and alongside withGM Felix, Alex Salinas and Felix’s sons, Kenneth and Francis, we set out tocompete in the Nationals, where we all qualified to represent Team USA in The World Championship in Cebu, Philippines end of July 2016. Thrilled we started training, never had I had to represent the United States in anything, and to be able to compete in a World Championship in the place and country of Origin of the art was truly a special opportunity. We had 3 months to prepare and we started meeting 2 times per week. However my life got challenging, I am an Actor and have a personal training business and work unfortunately declined and so did my income. A month away, I was having trouble at home, alongside witheverything else, it greatly affected my energy levels and my concentration for training. It didn’t look like I was going to make it to The World Championship. Alex Salinas had already bought his ticket and was going, but I didn’t have mine, regardless I decided to help him prepare and show up on Sundays to spar with him even though my motivation wasn’t all there. I had let the obstacles get in my way and it looked like I was going to have to postpone competing for another 2 years. What didn’t expect, was that 2 weeks before the tournament, my friend John called me up out of the blue, whom I hadn’t spoken to in months. He asked if I was going to the Philippines. I disappointedly told him that it didn’t look as if it was going to be possible. John said: You are going my friend, I am setting up a fundraiser for you. And so he did. within 6 days we raised all the funds necessary through generous friends and family. 4 days before departure I was able to get my ticket. I informed GM Felix that it was now all of a sudden possible for me to go and GM Felix decided last minute to join Alex and I, not only as our coach, but he also decided to compete for the first time in 16 years. I arrived 3 days before the tournament and Felix 1 day prior. We did some light training at GM Felix’s house in Cebu, to be as prepared as we possibly could be and then the event started. The first day, I was blessed to win Bronze in the padded stick event, which is an event that demonstrates, accuracy and speed. It was the first time I competed in this point system. The following day came themain event. “Single Stick”. I could see the pride in GM Felix eyes. Alex ended up wining Silver in his Single Stick division, which was disappointing for him, but he brushed it off and went onto win Gold in double stick where I was so blessed to win Bronze. Now was TheTeam Fights. The 3 best fighters from Each Country would fight each other. OurTeam was under the Umbrella of Team USA consisting of GM Felix, Alex Salinas and myself, it was a great honor to fight alongside GM Felix. We made it all the way to the finals where we were up against the Philippine Military Team. It was a fight to the last second, hundreds of people were gathered around our ring Yelling USA USA USA! and on the other side PHILIPPINES! PHILIPPINES! PHILIPPINES. It was an electric atmosphere and epic fight to the end. Our Team Pakamut ended up winning Silver in the Team Event. It didn’t matter that we didn’t get the Gold, because we knew we did our best and fought our hearts out.